CLOC Musical Theatre go into their dance as they celebrate 50 fabulous years of Melbourne music theatre magic. A hit for the company in 1996, CLOC has chosen beloved backstage musical 42nd Street to mark their golden anniversary, giving the show the full 2010s treatment of National Theatre staging and lavish production values beyond the high standard they had already reached in 1996. 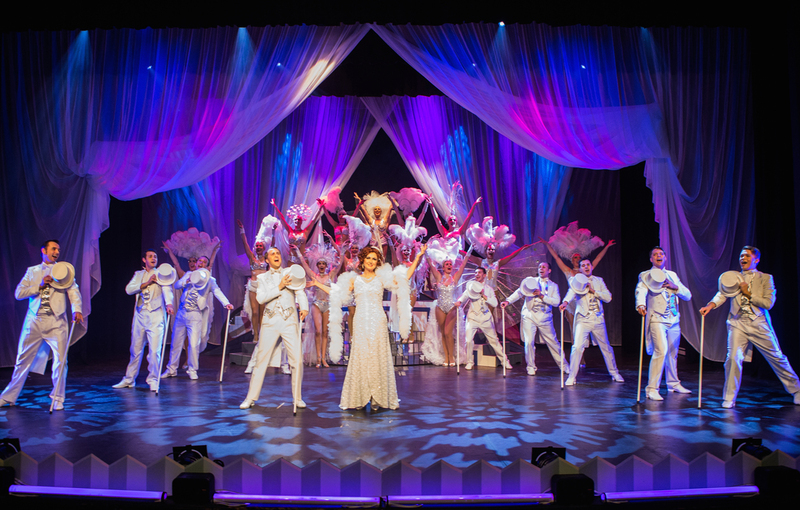 Splashy, old-fashioned song and dance shows like this are out of favour with commercial theatre producers, making 42nd Street’s welcome return all the more appealing. On top of wonderful designs and sensational choreography, this production is distinguished by some outstanding lead performances, which elevate the book well above its oft-maligned status as a collection of scenes that just link the big numbers. 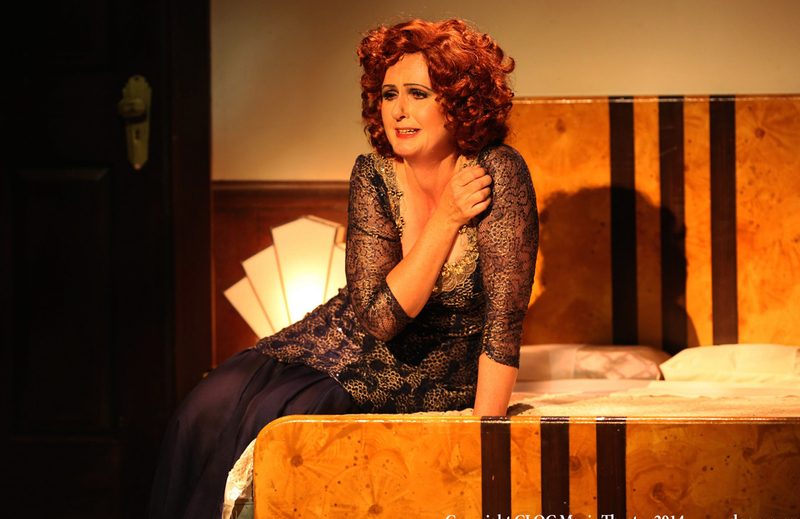 Eschewing the temptation for cartoonish characterisation and cheap laughs, Pam Christie Birkett plays fading diva Dorothy Brock in the way that Pamela Rabe might play her. Revealing raw layers of humanity, Christie Birkett develops a meaty arc for Dorothy, from her clear discomfort at returning to the stage on the purse strings of a simpering ninny of a sugar daddy, through her conflict over the temptation of broke old flame Pat Denning, to her out of town implosion where she loses the lot. Hazed and heartsick, Dorothy’s stage accident becomes perfectly understandable rather than a convenient plot twist, and her presence is missed for most of act two. 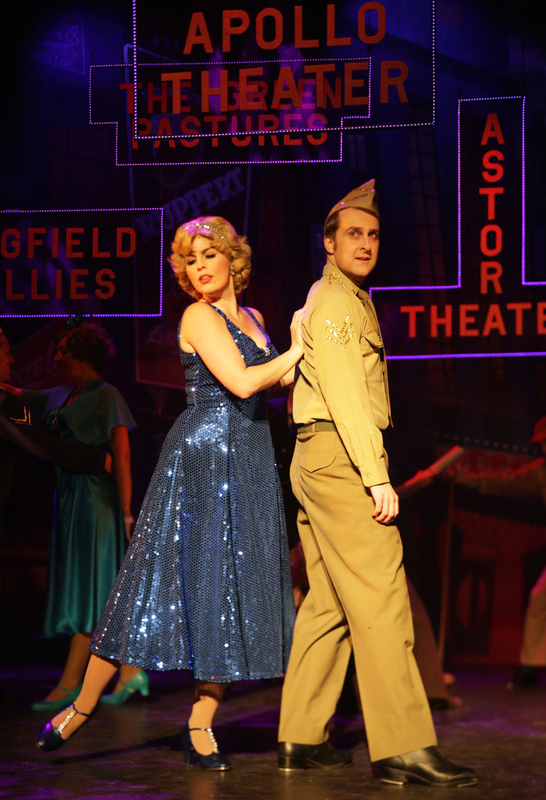 “You’re a looker, you can chirp like a bird, and you’re pretty hot stuff in the steps department.” Were truer words ever spoken about a Peggy Sawyer than the one played so superbly by Melanie Ott? With nary a bead of sweat, Ott sings, dances and acts up a storm, all while maintaining Peggy’s sunny, smiling disposition. For once, it makes total sense why Julian Marsh and co would want Sawyer for their show, and Peggy’s plucky heart-on-my-sleeve resolve makes it clear why Marsh would fall for his newly minted leading lady. Ott’s tap dancing is nothing short of extraordinary, and her flair for comedy is also a delight. With two such strong leading ladies, act two’s dressing room scene showdown becomes a highly anticipated, emotional scene rather than just a slow song between all the dance numbers. Christie Birkett brings Dorothy’s arc to a satisfying close as she shows a newly enlightened Dorothy graciously handing over the reins to Peggy. The moment where Dorothy stops singing to let Peggy finish “A Quarter to Nine” is just perfect. True triple threat Tim Cant stands out amongst the men, even if the absence “I Only Have Eyes For You” removes the romantic aspect of his role. Cant’s lovely tenor voice is a pleasure to hear, and his tapping is as strong as ever. Cant and Ott provide a stellar highlight in show-within-a-show Pretty Lady’s “Forty-Second Street,” performing a duet with tap vocabulary that says more than any words could say. Susan Lewis, with assistant choreographer James Rooney, has delivered a dazzling dance display that supports the storytelling with touches of wit and ingenuity. How brilliant to see Annie, Phyllis and Lorraine performing the steps in “Forty-Second Street” that they have rehearsed in “Go Into Your Dance.” The shadow work in “Shadow Waltz” is both divine and hilarious. Bev Woodford’s music direction brings out the exciting, brassy sound of the score. The pristine vocals from the ensemble are quite incredible given the amount of dancing they are doing at the same time. Marcello Lo Ricco’s sound design is reliably excellent, though some impact of the force of live music from the pit is lost by having it covered up so fully. Director Alan Burrow’s trademark “big picture” quality is on full show. He has brought out the best from a strong set of leads, and has maintained high energy and enthusiasm from the company. Small roles are well cast from the ensemble, with a favourite moment coming when conflict erupts between Anytime Annie and a chorine, played by sisters Tailem Tynan and Ashley Tynan-Mill. Having act two chorus opener “Sunny Side To Every Situation” sung to Annie is a masterstroke. Ric Birkett gives a solid performance as director Julian Marsh, although his singing voice does not quite have the commanding tone needed for Julian’s big numbers. Stephanie Powell is on the young side for experienced, motherly songwriter Maggie Jones, but captures her manic edge well. 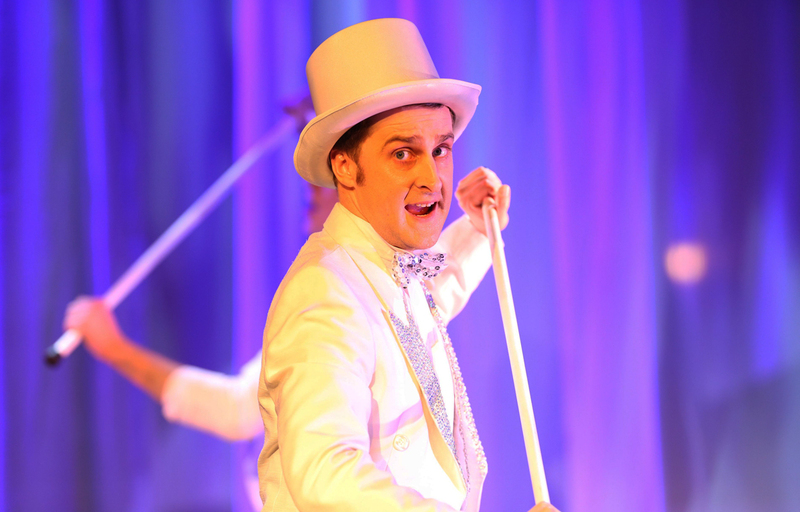 Scott Hili makes the most of the somewhat underwritten role of Maggie’s song writing partner Bert Barry, deftly conveying the nimble moves of a Vaudeville-era performer. Richard Perdriau gives a down to earth performance as Pat Denning that nicely complements Christie Birkett’s work as Dorothy. Graham McGuffie and Merinda Backway’s set designs get off to a slow start, with the backstage brick wall set on for much of act one. It is disappointing to see that their solid set for Dorothy’s dressing room is used poorly with barely one character coming through the door, the rest walking on and off through the (imagined) wall. The pair’s prime achievement here is Broad Street Station, which features detailed tile work, infinite overhead arches and a gleaming distant rear window. The hanging marquees of Broadway are also a beautiful sight. Victoria Horne has outdone herself yet again, with costumes that sparkle like the top of the Chrysler building. The intricate, individual headwear in “Dames” evokes the MGM glamour girl look, “We’re In The Money” outfits gleam with the green of US cash, and the “Forty-Second Street” costumes, in which even the janitor’s uniform is trimmed with sequins, suggest a whole world at play in old New York. Costumes for leading ladies Dorothy and Peggy are not only exquisite but also intelligently trace the characters’ progress through the story. If there is one element that could have improved the production, it would have been use of the new book and score from the 2011 Broadway revival of 42nd Street, but presumably this is not available for licence. 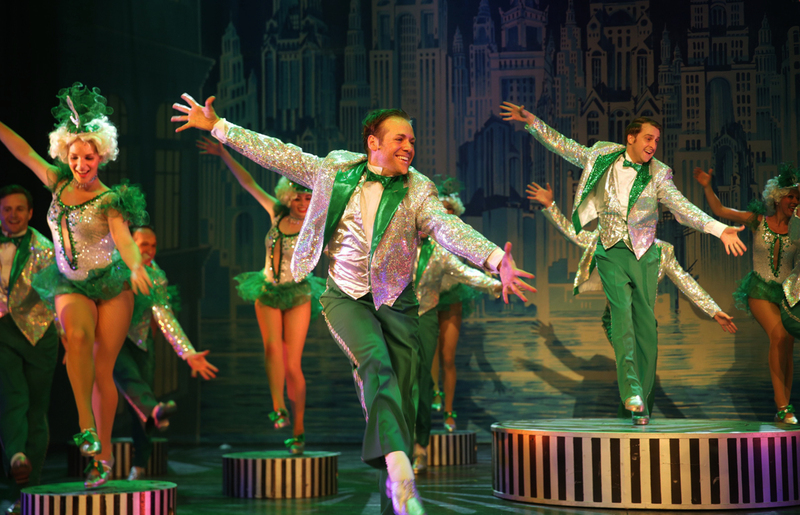 Go and meet those dancing feet at CLOC’s 42nd Street. We may have to wait another 50 years to see this show done so well. 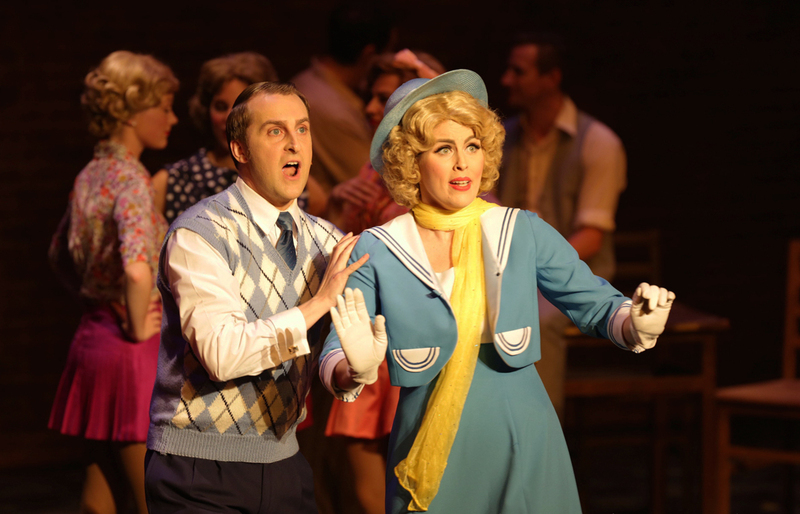 42nd Street plays at National Theatre, St Kilda until 25 May 2014.